XEO comes bundled with a set of predefined components to help you deal with various situations, but there will always be a situation where you need something so specific that you'll have to create your own custom component. To create a new Custom XEO Web Component you'll need to define an implementation class which will be responsible for declaring the component properties and the component's logic. A custom component must extend the netgest.bo.xwc.framework.components.XUIComponentBase class (or any class that extends from that one, including XEO's own components). When creating an implementation class you declare the set of properties of the components as class variables (of a particular type) and you can redefine some of the methods that are responsible for component logic (inherited from the XUIComponent Base Class). Read the following paragraphs in order to know how to declare component properties. When declaring properties you'll also need to declare their data type (any type is valid). bellow is an example of declaring a property named text (of type String) and "bindable" to a Java bean. and like the following if the property is binded to a Java bean property. preRender - Method that's executed right before the component is rendered to the client and allows you to make modifications to the component after the initialization. initComponent - Method that's executed after the component is created, it's used to perform the component initialization. wasStateChanged - This method is invoked by the framework to determine whether the component should be updated client-side (browser). If it returns true the component will be updated on the client and if it returns false it will let the component decide for itself. The renderer class can have any other name, just be sure that when registering the component you use the same name (if using XEO Studio's Web Component Wizard, this step is not necessary). The skeleton of a renderer class is shown bellow. There are three main methods in a renderer class. The encodeBegin, encodeEnd and decode methods. The encodeBegin and encodeEnd methods are automatically invoked to render the start of the component and the end of the component (in between, if the component has any child components, their renderers will be invoked). The main idea with these two methods is, in the encodeBegin method to create a div with the component's id and in the encodeEnd method to close that div (after creating or before closing the placeholder you generate the html that will actually how the component is rendered). The decode method allows you to retrieve values sent from the component when the form inside the viewer is submitted to the server. Notice that the XUIResponseWriter has methods ( startElement, endElement, writeAttribute) that ease the creation of HTML tags (and auxiliary classes HTMLTag and HTMLAttr with static properties with the names of all HTML tags and attributes so that you don't need to write the tags yourself (although you can, as depicted in the code above)). You can add the script to the header or footer of the page. When adding full scripts (aka, making includes) you should add them using POSITION_HEADER so that they are available later on. When adding scripts to be executed, or functions that are invoked by buttons, links or alert messages you should POSITION_FOOTER. The "SCRIPT_ID" parameter is the identifier of the script. If you want to replace an existing script you should add it with the same id as the previous one. It's possible to use the custom component as a servlet. Imagine that you want to create a component that displays a dynamically generated image in a viewer (such as a chart, for example). You can use the renderer class to generate an html img tag and set the source of the image to be the address of the component's servlet. The service method has access to the HttpRequest and HttpResponse just like an ordinary servlet, as such it can return the bytes representing a generated image. The service method also has access to the component, so that you can check property values and generate the response accordingly. There are two entries for each registered component. One for the renderer class and another for the implementation class. Components are grouped by their namespace (as depicted in the XML declaration above, for the "myComponent" component registered in the "my" namespace). 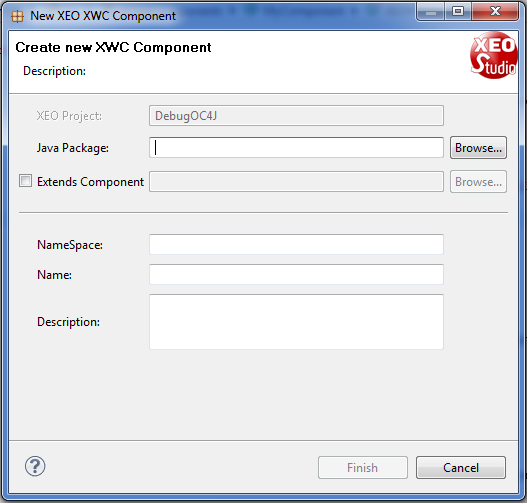 To create a new custom component you can use XEO Studio's wizard. Go to the "File" menu, choose "New" and find "XEO Web Component", the window depicted in figure CustomComp.1 should appear. In the Java Package field choose an existing package, for the namespace choose "my" and name the component "MyComponent" (description can be empty). XEO Studio will generate a sample component that you can customize. You can remove all of the properties and logic from the implementation class as well as remove any code from the renderer class methods.